The magnificient Chapel, inside "Palazzo dei Normanni"
The Palatine Chapel (Italian: Cappella Palatina) is the royal chapel of the Norman kings of Sicily situated on the ground floor at the center of the Palazzo Reale in Palermo. The chapel was commissioned by Roger II of Sicily in 1132 to be built upon an older chapel (now the crypt) constructed around 1080. 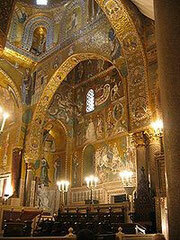 It took eight years to build and many more to decorate with mosaics and fine art. The sanctuary, dedicated to Saint Peter, is reminiscent of a domed basilica. It has three apses, as is usual in Byzantine architecture, with six pointed arches (three on each side of the central nave) resting on recycled classical columns. The mosaics of the Palatine Chapel are of unparalleled elegance as concerns elongated proportions and streaming draperies of figures. They are also noted for subtle modulations of colour and luminance. The oldest are probably those covering the ceiling, the drum, and the dome. The shimmering mosaics of the transept, presumably dating from the 1140s and attributed to Byzantine artists, illustrate scenes from the Acts of the Apostles. Every composition is set within an ornamental frame, not dissimilar to that used in contemporaneous mosaic icons. The rest of mosaics, alternatively dated to the 1160s or the 1170s, is executed in a cruder manner and feature Latin (rather than Greek) inscriptions. Probably a work of local craftsmen, these pieces are more narrative and illustrative than transcendental. A few mosaics have a secular character and represent oriental flora and fauna. This may be the only substantial piece of secular Byzantine mosaic extant today. The chapel combines harmoniously a variety of styles: the Norman architecture and door decor, the Arabic arches and scripts adorning the roof, the Byzantine dome and mosaics. For instance, clusters of four eight-pointed stars, typical for Muslim design, are arranged on the ceiling so as to form a Christian cross. Other remarkable features of the chapel include the Carolingian throne, a low stage for royal receptions, and a balcony which allowed the king to view religious processions from above. In addition, the muqarnas ceiling is spectacular. The hundreds of facets were painted, notably with many purely ornamental vegetal and zoomorphic designs but also with scenes of daily life and many subjects that have not yet been explained. Stylistically influenced by Iraqi 'Abbasid art, these paintings are innovative in their more spatially aware representation of personages and of animals.